START RIGHT NOW WITH THE FREE MOBILE APP! The IFT High-Yield Course is based on Pareto’s 80-20 rule according to which 80% of the exam questions are likely to be based on 20% of the curriculum. Hence the course focuses on the 20% material which is most testable. The High-Yield course is very helpful to review and refresh those readings you covered earlier and especially in the final 3 months before your exam. 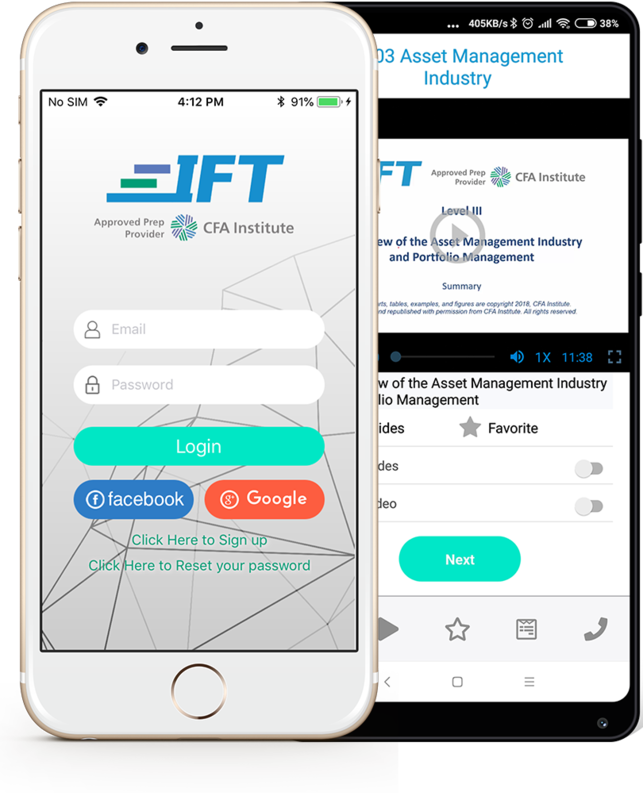 Download the IFT Mobile App to make your exam preparation High-Yield! The FREE App contains all High-Yield Videos & Notes for 2 key exam topics and other bonus materials. You can upgrade to the Full App if you buy an IFT product. For full details click here. CFA® INSTITUTE DOES NOT ENDORSE, PROMOTE OR WARRANT THE ACCURACY OR QUALITY OF IFT. CFA® AND CHARTERED FINANCIAL ANALYST® ARE REGISTERED TRADEMARKS OWNED BY CFA® INSTITUTE. © IFT. All rights reserved.